A focal point in the Santa Fe Botanical Garden at Museum Hill is the beloved “red bridge,” also knows as Kearny’s Gap Bridge. Built in 1913 for San Miguel County by the Missouri Valley Bridge and Iron Company, the bridge is 62 feet long and 16 feet wide. It is a free-span, steel, subdivided Warren pony truss bridge. The Warren Truss design is recognizable by major cross-bracing along each side of the structure. This design was patented in 1848 but its use was most popular between 1870 and 1900. 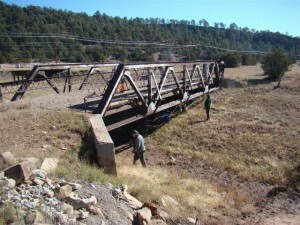 A NM Department of Transportation survey completed in 1987 reports that there are eight Warren Pony Truss bridges still in service and notes the Kearny’s Gap Bridge as being of historical and engineering interest. The bridge was originally in service along State highway NM 283 which follows the route of the Santa Fe Trail, southwest of Las Vegas, NM. When the highway was widened and moved to the north, the Kearny’s Gap Bridge was abandoned in its pasture on parcels owned by the children of David Thomas “Dee” and Mabel Bibb and the City of Las Vegas. Well known ranchers and respected as quintessential westerners throughout the area, Mabel is remembered as a civic minded woman who loved the landscape and felt strongly about its stewardship. She collected silver and worked as a silver appraiser, and served on the State Water Board, appointed by Governor Bruce King. Dee was a rodeo star and world champion in the bulldogging event. He is a member of the Cowboy Hall of Fame in Oklahoma City and is recognized at the NM History Museum. His band, Dee Bibb and his Orchestra, entertained many Northern New Mexicans with rollicking cowboy music. The Botanical Garden straddles the Arroyo de los Pinos, requiring a pedestrian bridge to connect the gardens to one another. The bridge is positioned across the arroyo with a view of the 1930s Civilian Conservation Corp historic gabion dam, and the long view downstream to the Jemez Mountains.